Disney put this famous bird on display next to his queen, even though it was made of birch and couldn’t fly. Walt Disney acquired the Spruce Goose plane in the 1980s along with the Queen Mary in Long Beach, CA. Neither made money, so the plane was given to the Evergreen Museum. It cost $10 million to move the plane in pieces on a barge up the Pacific Coast, the Columbia River and Willamette River, then trucked the last 7 miles. It was reassembled and opened to viewing in 2001. Winners of the draw for correct answer were Pat Schneider and Agnes Stuerle, who each won a $20 Travel Voucher for their next Wells Gray Tour. 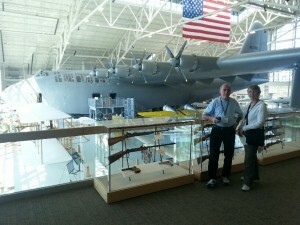 The Mystery Tour visited the Evergreen Aviation Museum in McMinnville, Oregon. The centerpiece of this vast collection is Howard Hughes’ Spruce Goose airplane. Walking into the museum and looking up at this massive plane is amazing! The group stayed at the Embassy Suites Hotel in Bellevue. Everybody enjoyed the evening cocktail reception. Wells Gray Tours has never stayed at this hotel before, but we frequently stay at the Embassy Suites in Lynnwood, about 15 miles away. Stay tuned for the last clue!